Making home-made pizza at home is not easy. Before you start laughing, I'm not talking about throwing a frozen pizza in the oven. I'm talking about home-made dough and home-made sauce. The dough is my challenge. I know it shouldn't be as hard as I seem to make it. Yet somehow it is. Our favorite pizza place, Pizza Antica is right across the street. We could just go there. But that's too easy. The challenge of perfecting the dough has me obsessed. At the moment. It never comes out crispy. I've bought pizza stones and pizza pans. What I really need is a pizza oven that heats to a high temperature with a surface you can lay the pizza on to give the crust the crispiness it deserves. Well, I don't have a pizza oven. And as much as I would like to build a fabulous grill and outdoor oven in my backyard, I can't do that either. We don't have a backyard. And our back patio is about the size of a shoebox. But I will not give up. I've decided I'm going to grill the pizza. Forget about trying to make it like a PIZZERIA. Light up the grill! First the dough. I'll spare you the details. Let's just say that for the first time EVER it's perfect. It's spongy, doughy, and a bit like heaven in a bowl. I'm super excited. Next, the sauce. It's really easy to make. It looks good, and tastes good. Excellent. Now it's time to grill. I'm making three pizza's. One for each of us. And guess what?!! Voila! They're done! They're tasty and delicious. I DID IT!!!! I'm dancing around the grill and our kitchen like I won a marathon or something. Battle Pizza Dough is a success!! Phew. I can now check this one off the list and move on to mastering pie crust. Another one of my obsessions. 1. In the bowl of a standing electric mixer fitted with a dough hook, combine the yeast, sugar and warm water; stir gently to dissolve. Let the mixture stand until the yeast comes alive and starts to foam, about 5 to 10 minutes. 2. Turn the mixer on low and add the salt and 2 tablespoons of olive oil. 3. Add the flour, a little at a time, mixing at the lowest speed until all the flour has been incorporated. When the dough starts to come together, increase the speed to medium; stop the machine periodically to scrape the dough off the hook. Get a feel for the dough by squeezing a small amount together: if it's crumbly, add more water; if it's sticky, add more flour - 1 tablespoon at a time. 4. Mix until the dough gathers into a ball, this should take about 5 minutes. 5. Turn the dough out onto a lightly floured surface and fold it over itself a few times; kneading until it's smooth and elastic. Form the dough into a round and place in a lightly oiled bowl, turning it over to coat. Cover with plastic wrap or a damp towel and let it rise in a warm spot until doubled in size, about 1 hour. 6. Once the dough has risen and is kind of spongy, turn it out onto a lightly floured counter. Roll and stretch the dough into a cylinder and divide into 3 equal pieces. Cover and let rest for 15 minutes so it will be easier to roll out. In the meantime, make the pizza sauce. 1. Coat a saute pan with the olive oil and place over medium heat. When the oil gets hot and a little smokey, add the onion and garlic, cook and stir for 5 minutes to soften. 2. Stir in 1/2 bunch torn basil leaves. Add the tomatoes, cook and stir until the liquid is cooked down and the sauce is thick, about 10 minutes; season with salt and pepper and then take it off the stove. Preheat your grill to get it very hot. 1. Roll or pat out each piece of dough into rustic, oblong shapes, about 1/4-inch thick – do this directly on a lightly floured cutting board. 2. Brush the dough with a thin layer of olive oil, and lay oil-side down onto the hot grill. 3. Once the dough looks set, in about 2 minutes, turn the dough over. 4. Spread the tomato sauce evenly on the dough with a ladle. 5. Rip the mozzarella into pieces with your hands and distribute them on top; layer on the toppings: pepperoni, mushrooms, jalapeno, peppers all over the pizza. 6. Close the grill cover and cook until the cheese is melted and bubbling and the crust is golden and crisp, about 5 minutes. 7. Remove the pizza from grill and sprinkle with some fresh basil leaves and a good dusting of freshly grated Parmesan. Now that you have home-made pizza, you might as well whip up a quick salad dressing to serve on the side. How about a nice home-made Balsamic Vinaigrette? I'm not in a Caesar mood today. 1. Mix all ingredients in a jar and shake, shake, shake it up. 2. Dance around the kitchen one more time. Ok. Now it's done. Pour over your favorite lettuce and some sliced cherry tomatoes. ps. You don't have to kill yourself making dough. You can pick up dough at Trader Joe's or Whole Foods. About an hour before you are ready to make the pizzas take the dough out of the fridge and let it come to room temperature. This will make it easier to shape. I like to flour a cutting board, take the dough out of the wrapper, set it on the floured board and cover it with a damp paper towel. 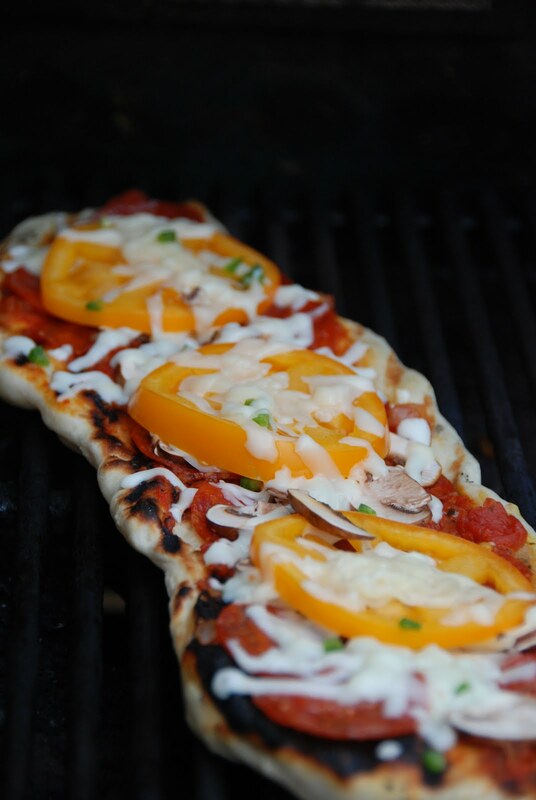 We are huge fans of pizza on the grill - yours looks wonderful! Welcome to Tyler Florence Fridays. Pizza is probably my very favorite food, so I'm always trying out new recipes. Haven't made Tyler's yet, but definitely want to try it on the grill. Welcome to Tyler Florence Fridays! I love making pizza at home and this looks like it turned out wonderful. Love the pics. Welcome to TFF! 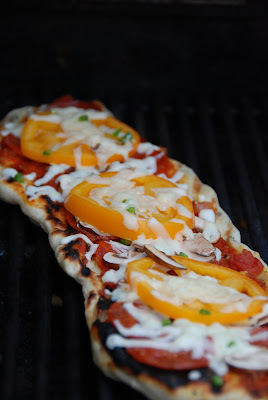 I love making pizza at home but have never made it on the grill. Usually my dough gets too crispy...probably because I try to spread it too thin. The best thing about pizza is its versatility so it's perfectly normal that you swapped around the toppings. Tyler's pie crust is great also, by the way. 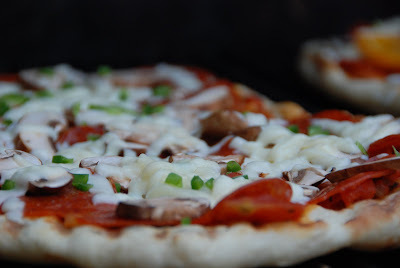 I love making pizza on the grill, it always turns out so nicely. Beautiful photos--your pizza looks delicious! Welcome to TFF!